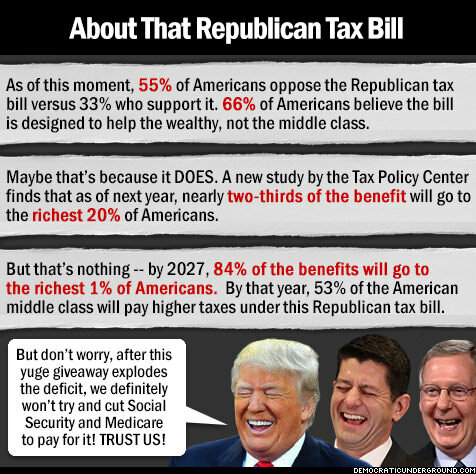 After the Republican Congress' tax cut bill, giving the wealthy a huge break at the expense of middle-class and poorer Americans, Social Security, Medicaid and Medicare apparently are next in target line. As predicted, recognizing that the tax cuts will blow a hole in the federal deficit, Republicans will be targeting federal spending programs to pay for a healthy share of the $1.5 trillion overspend that the corporate tax cuts will cost over 10 years. Social services make up the biggest share of entitlement programs, so anything touching health, services to the most vulnerable in our society or non-military will be huge targets, Republicans acknowledge. From a variety of news reports, it appears that the Trump administration and Republicans in Congress led by Speaker Paul W. Ryan are looking to make the most sweeping changes to federal safety net programs in a generation, using legislation and executive actions to target recipients of food stamps, Medicaid and housing benefits. The White House is said to be preparing a sweeping executive order that would mandate a top-to-bottom review of these programs on which millions of poor Americans rely. And Republicans congressional members crafting legislation that could make it more difficult to qualify for those programs. A recent report in Politico, for example, said that federal health officials are encouraging states to impose work requirements on able-bodied adults on Medicaid—a major philosophical shift that would treat the program as welfare, rather than health insurance. The Agriculture Department said last week that it would soon give states greater control over the food stamp program, potentially opening the door to drug testing or stricter work requirements on recipients of the $70 billion program long targeted by fiscal conservatives. The Veterans Affairs Department announced it would redirect hundreds of millions of dollars from a program for homeless veterans to local VA centers, but it reversed course after fierce protests. Of course, maintaining these programs were another Donald Trump campaign promise, but I doubt that you will be hearing much of that. Conservatives have long wanted to devolve control of social programs to the states and impose stricter work and drug testing rules. Republicans believe they have an opportunity to overhaul those programs, which they have long argued are wasteful, are too easily exploited and promote dependency. Of course, the recent election of Democrat Doug Jones to the Senate from Alabama may make sure passage of any such legislation more difficult, since Republicans now will have a mere two-vote majority. Politico reported that the president is expected to sign the welfare executive order as soon as January, according to multiple administration officials, with an eye toward making changes to health care, food stamps, housing and veterans programs, not just traditional welfare payments. Do expect that there will be howls of protest particularly from groups representing seniors, the health industry, poverty programs and the like. But those folks are hardly donors to Republican senatorial reelection campaigns. What these moves are certain to accomplish is a further division in a continuing fracture in the country, adding a kind of class warfare front to the current divisions. The effort is supposed to be a major focus for a Republican retreat next month. Speaker Ryan has written his “Better Way” plan to create a giant move of entitlement programs to the states. Of course, the states in turn, particularly Republican-led states, do not want full financial responsibility for such programs. In recent days, Ryan said he hopes to embark on entitlement and welfare reform next year. He has said entitlement reform—an overhaul of programs like Medicare and Medicaid that has been his priority since his days as Budget chairman—is essential for tackling the debt, which is set to surge by $1 trillion under the Republican tax reform bill, according to the Joint Committee on Taxation. Democrats, who have been short on actual program proposals, will inherit a full campaign agenda from these actions, of course. “Paul Ryan just admitted that after providing $1 trillion in tax breaks to the top 1% and large corporations, Republicans will try to cut Social Security, Medicare, Medicaid and help for the most vulnerable Americans,” Sen. Bernie Sanders (I-Vt.) wrote on Twitter. If Republicans steer clear of Medicare, they say they will need to cut deeper into programs like food stamps and Medicaid. Despite Trump’s campaign vow on Medicaid, the GOP already placed the health insurance program for the poor on the chopping block earlier this year as part of its failed push to repeal Obamacare, proposing to siphon nearly $800 billion from the program over a decade. One of the biggest programs that could be in the administration’s crosshairs is food stamps, or the Supplemental Nutrition Assistance Program, a program that helps one in eight Americans buy groceries each month. The Department of Agriculture has said it’s developing a policy that could make it easier for states to impose stricter work requirements or drug testing on recipients—things that states like Wisconsin and Florida have long tried to do, but have been blocked by either courts or USDA. At the Department of Housing and Urban Development, Secretary Ben Carson has made clear his philosophy that welfare fosters dependency and has said the government should be focused on the business of getting people out of public housing. Get ready. You can already see this front coming. Terry H. Schwadron is a former editor for The New York Times, The Los Angeles Times and The Providence Journal and is an active volunteer with immigrants and writers and plays trombone in New York City. He blogs here.